Uruguay coach Oscar Tabarez wants to remain in charge of the South American side following their fourth-place finish at the World Cup. The former AC Milan boss' contract expired following the 3-2 third-place play-off defeat to Germany on Saturday but the 63-year-old is keen to continue in the post he has held since 2006. He told FIFA.com: "I am nearer to the end of my career than the beginning, but I feel fine physically. 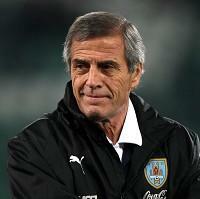 It would interest me to continue with Uruguay, but it is not the time to be speaking about that."